Foreclosure ! 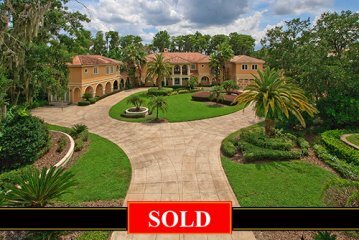 This palatial, lakefront, gated estate sprawls across two lakefront lots on the famed Butler Chain of Lakes in prestigious Windermere and only minutes from all conveniences and Orlando attractions. 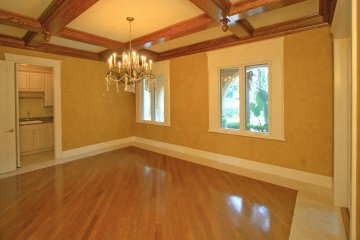 The property is located within a gated estate community and offers its own gated entrance as well. 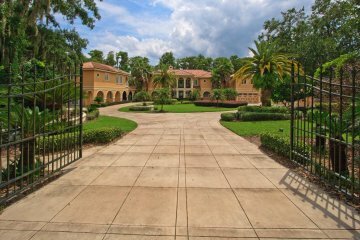 The estate is set back on the lot and is approached through the gate and impressive circular drive and boasts a very elegant entrance. The property is very comprehensive in its scope and offers a main residence, with a covered loggia leading to a private guest/staff apartment and a separate, detached structure with generous living quarters for additional family, guests or staff. There are six garages, two of which are designed for limousines and four additional, oversized garages. 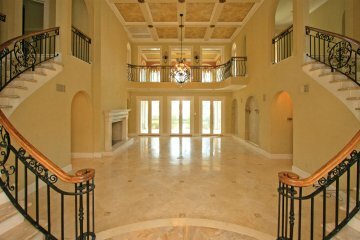 An impressive iron double-door entry opens to the formal, lakefront, grand salon which boats twin, winding staircases and gleaming marble floors under 30’ ceilings. A grand, stone-faced fireplace accents the room. 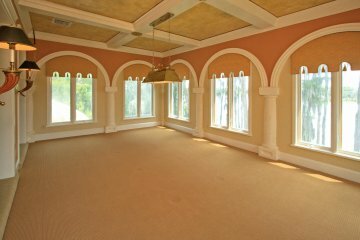 One captures a view of the lake through French doors in the grand salon which open to a screened porch. 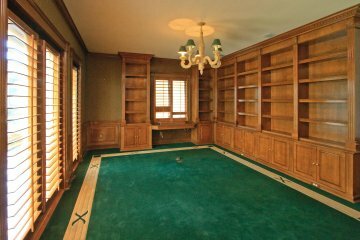 A handsome, lakefront gentlemen’s library/office with full bath boasts custom paneled walls, bookcases and French doors leading to the lake. 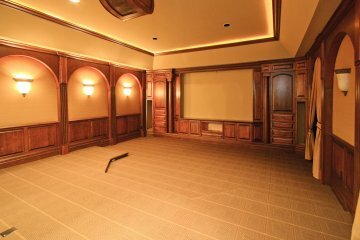 Your family will enjoy a spacious media room located on the first floor also. The second floor offers four bedrooms with the potential of two additional bedrooms. 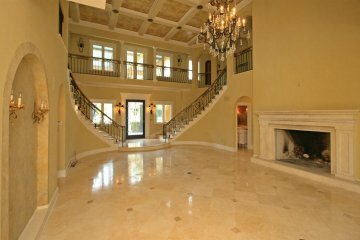 A luxurious, lakefront master suite has a dramatic, marble bath, wardrobe room and further boasts a private lakefront balcony and exterior staircase leading to the lake. 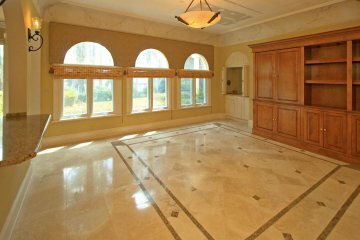 A large billiards/game room features beautiful lakefront vistas through glass window/walls which span the rear of the room. 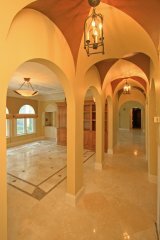 A covered loggia leads from the main residence to a spacious guest/staff one-bedroom apartment with living/dining room and mini-kitchen, full bath and walk-in closet, and has its private exterior entrance. There is potential to develop a second guest/staff apartment, as it offers an existing full bath and closet and also its own exterior entrance. A detached structure is located on the residual land which consists of garages on the first floor and a spacious living area on the second floor, which has its own exterior entrance. This space has the potential of being a three-bedroom apartment with living/dining room and family room/office, and potential kitchen. There is unlimited use for this space and creates an opportunity for one to customize it for your own specific needs. There is sufficient remaining land to expand this structure if needed. 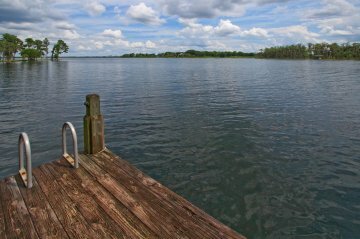 Amenities include an Olympic sized pool with diving board and adjoining wet bar, sauna, shower and full bath. 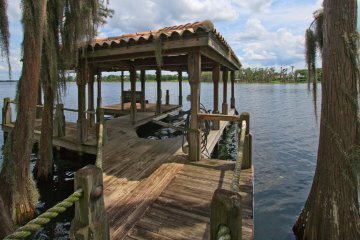 A private boat house with seating deck and lifts will allow you to park your boat on your own property, from which you can enjoy fishing, swimming, boating and water sports on the famed Butler Chain of Lakes – a series of 8 lakes connected by navigable canals. 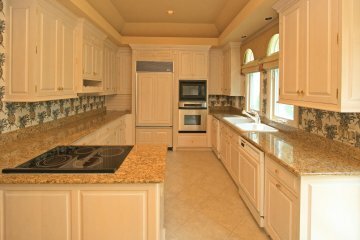 This estate is bank-owned and is priced realizing that there is a need for some cosmetic work to be done; however, all major repairs have been completed by the bank. 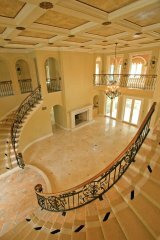 This is a signature, celebrity property in the Orlando area and offers your family the best lifestyle Florida can offer. 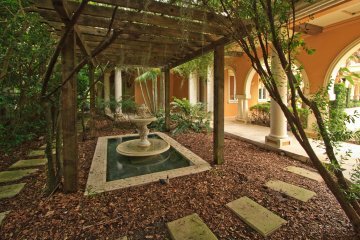 Consider this a corporate retreat or a fabulous family retreat – near everything the Orlando area has to offer !